Acclaimed international musicians Italian pianist Alessandra Pompili and Icelandic clarinettist Einar Johannesson join forces to present an inspirational programme of music on an Italian theme, including pieces by Liszt and Nino Rota. 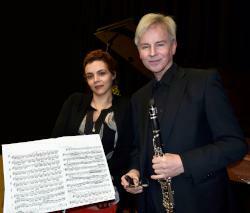 Einar is former principal clarinet of the Iceland Symphony Orchestra. Alessandra performs in major concert halls around the world.